Diggers Valley: 15 October 2016. The week beginning the 15th of October 2016: part II. The irresistibility of fresh soil. Stephan didn't put a tape around the earthworks in Mushroom 1 so Queenly 107 accepted the open invitation to enjoy herself. We're now helping Imagen's calf morning and evening, mostly because Imagen's udder is so huge but also because the calf is still a bit too slow to feed as well as he needs to. This should all come right in time and he will probably grow into one of our largest calves; but he's taking a fair bit of support to get there at the moment. I like to have some idea about where the newborn calves are, but hadn't seen Dexie 101's bull since she fed him early this morning. 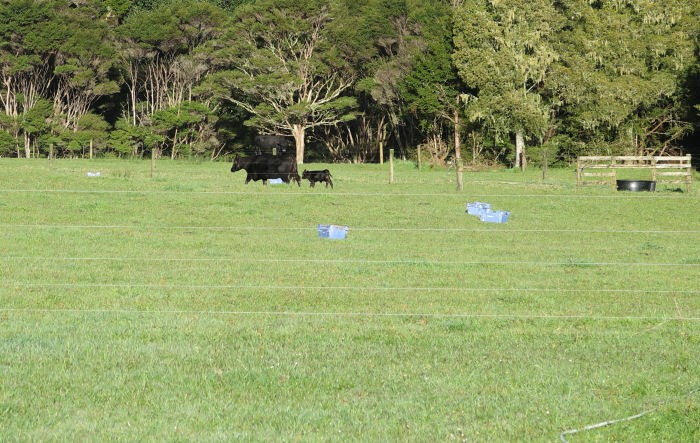 The Mushroom paddocks' gates are all open at present because 710 had to be allowed into MR3 to find her calf and so sometime yesterday Dexie had moved her calf in there too. 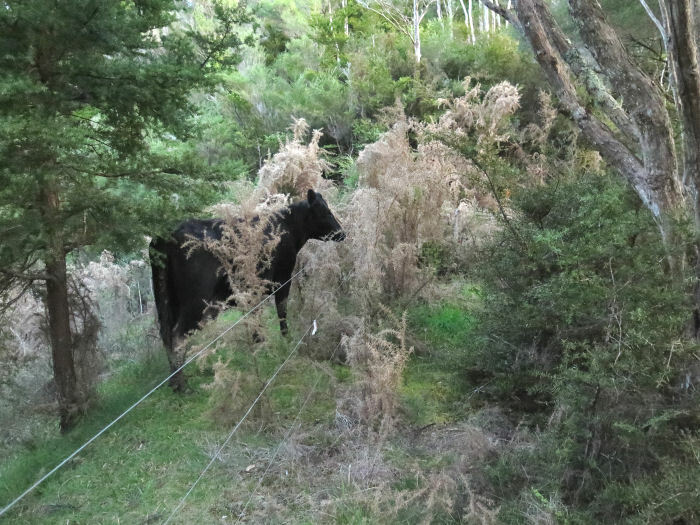 When I made a calf-like noise, Dexie looked up the slope into the corner of the paddock, so I went up to look, soon followed by the tramping of heavy feet as she quickly followed me and then stood looking very intently in what I thought was an unlikely direction: the ridge is quite narrow, following around to the right but dropping sharply away where an old slip has dropped in to the stream below. The calf was asleep right on the edge and I concluded that as his mother obviously knew exactly where he was, it was safest to leave them alone. My early morning check discovered Dexie feeding her calf and he must have gone back to his hiding place again afterwards. If they find an out-of-the-way lying-in spot, they'll often return to it repeatedly for the first two or three days. 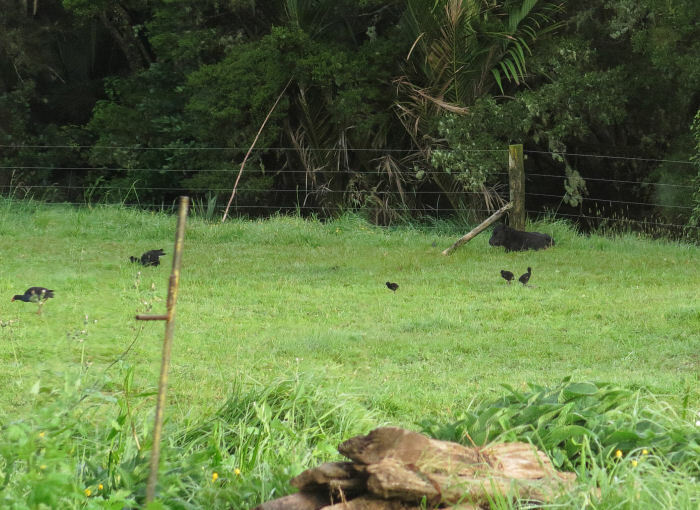 Here is Jemima 146's little calf, surrounded by other little black babies: the Pukeko family still comprises six chicks, growing rapidly. Endberly, in labour, pacing around a resting Eva, late this morning. At the same time I was watching 729, also beginning her labour. The two cows got in calf eight days apart: Endberly to 137, now at day 277 of gestation, a day earlier than I expected and 729 to Eva's son, 144, now up to day 285 and five days later than I calculated. 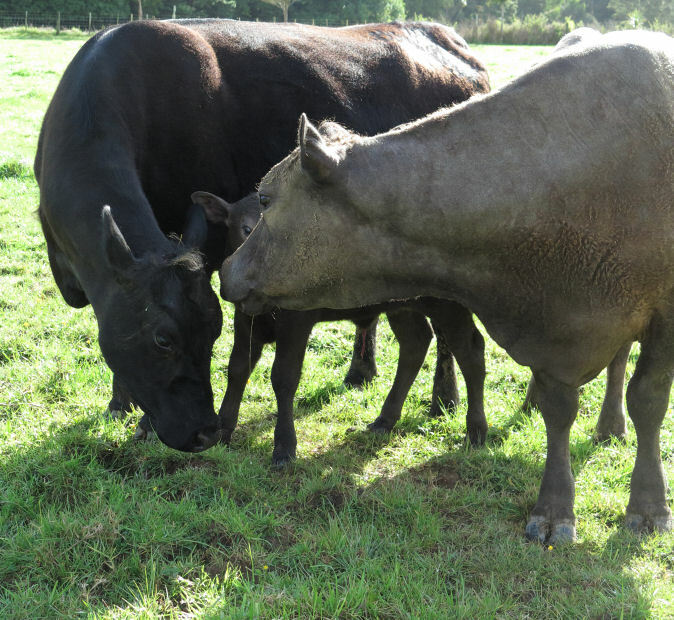 Endberly's calf was born at noon and his mother wasn't even the first to greet him, 703 having arrived for first sniff. 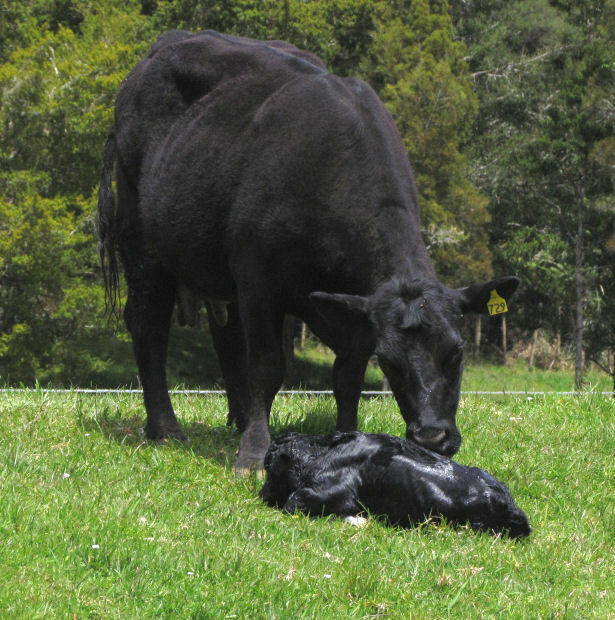 729 had just produced her calf when I went back to check her at 1pm; she had a bull too. 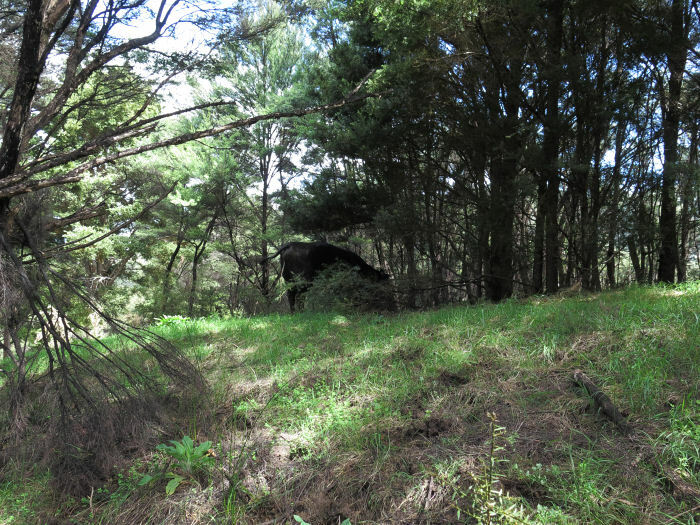 The calf gradually slid down the grassy slope as he repeatedly attempted to get to his feet. It wasn't a dangerous place, just inconvenient. Endberly's calf, all clean and dry and a strange-looking individual. Jemima 146 and her pulled-into-the-world calf. He has been lying around a lot, which is entirely normal, but hasn't provided me with much opportunity for reassurance that his front legs are comfortable after being pulled with the calving chains. I think he's fine. He isn't quite as odd-looking as in the photo, where his body is slightly twisted, making it look weirdly short. I am exhausted. It has already been quite a week! I found 101's calf sitting beside the gate between Mushroom 1 & 2 this morning (closed yesterday so I could keep 729 there while she was calving) but when I quietly went and opened it, Dexie called her calf to follow her and very smartly took him away to their hiding place again! They'll come back when she's ready. Curly wandered around Flat 1 for ages late this morning, before finally lying down and doing anything interesting. 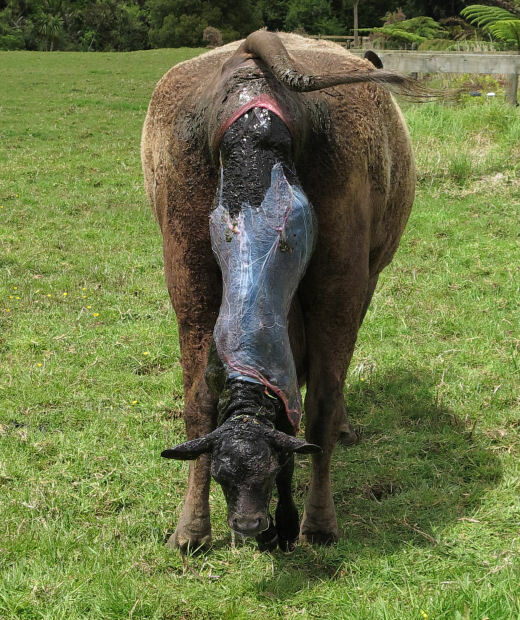 From the house, through binoculars, it looked very much like she had an upside-down foot coming out and, on closer inspection, it certainly did look very much like that, because the calf was coming out somewhat twisted to the right. But in a big cow, even with an unusual exit angle, there's enough room to get out safely, even if your mother makes you hang around for a bit. Curly has another curly daughter. For the first time we'll have two hypotrichosis heifer calves in the mob. 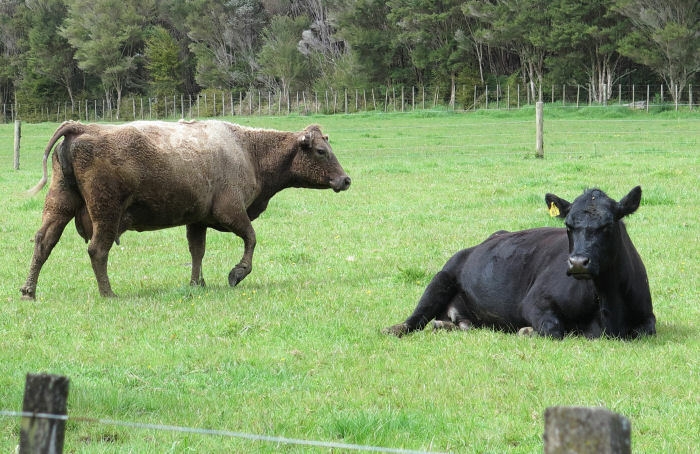 They're both from very productive families so it looks like there'll be a few more non-black cows around for a few more years yet. There have been a few snails on the tracks at night lately but this evening, after a bit of rain, they were all out and it was snail massacre time on the bike! It's such a satisfying noise, crunching over snails with wheels. I see bits of snail flying up past me (mostly) as I ride and do my best to squash as many as possible. 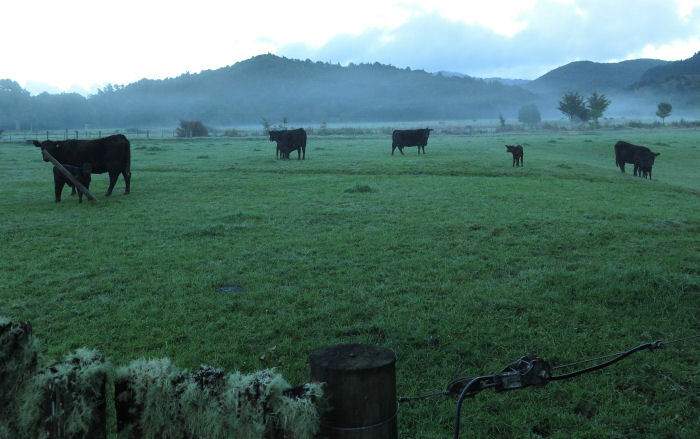 I wasn't quite early enough to catch all the calves feeding at the same time this morning. Erin 132 is in Flat 1 with 475, 725, Endberly and their three calves. She seemed quite happy to be near Endberly's new calf this morning. Erin's udder is now returning to its non-lactating state. If she were not now firmly on the cull list we might have experimented with milking her, since she's a nice quiet cow. 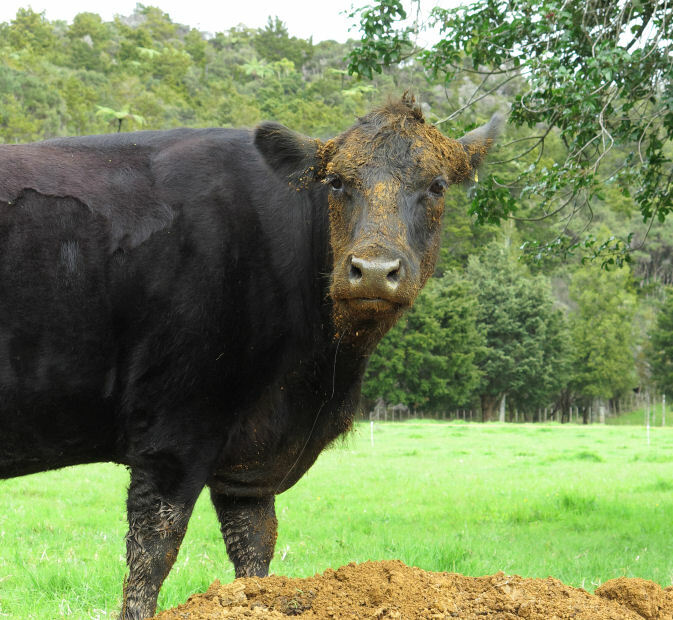 But with her odd health issue last year and a dead calf this year, I didn't want to risk more problems. The crossing near the Back Barn paddock has been changing shape with every flood. In the flood which caused the huge slip up in the bush, a huge amount of silt was deposited on the other side, which has since then caused the stream to bend a bit more sharply than it did, which has gradually scoured out this side's approach to the crossing. But nothing could be easily reshaped without first moving the main water pipe, which was what Stephan went out to do today. 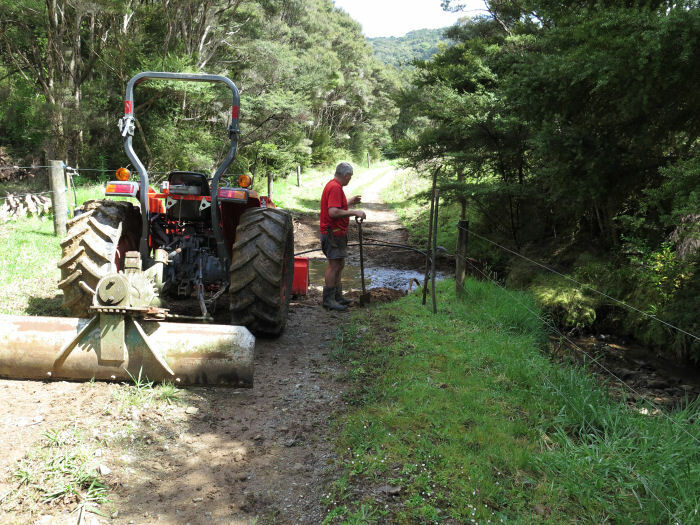 He dug back on both sides (it was buried somewhere in the centre of the track many years ago) and then added pipe to allow it to be slung up and along the fence across the stream. 703 was standing beside the fence in Flat 5d, looking very dippy in her pelvis. Her udder is also well filled now and by my calving spreadsheet, I say she's due in two days, although I suspect, seeing this, she'll not be waiting very much longer. Imagen's calf was awkwardly feeding in the lane, where the two cows are currently grazing for the day. At least he's now trying. I went to do my daily check on the six animals in the Tank paddock, finding only five of them sitting in the shade under the trees. 742 was missing and as the next due to calve, albeit not for five days by my calculation, it seemed pretty likely she'd gone off to have her calf somewhere. I climbed the hill behind the tank, listening for the characteristic moo the cows make to their just-born calves, which carries a surprisingly long way. I didn't hear anything for a long time, then a strange sort of noise which sounded alarmingly like a stuck animal but wasn't. It was probably just the first little noises 742 was making to her just-born calf, flopping around under the trees as I arrived. 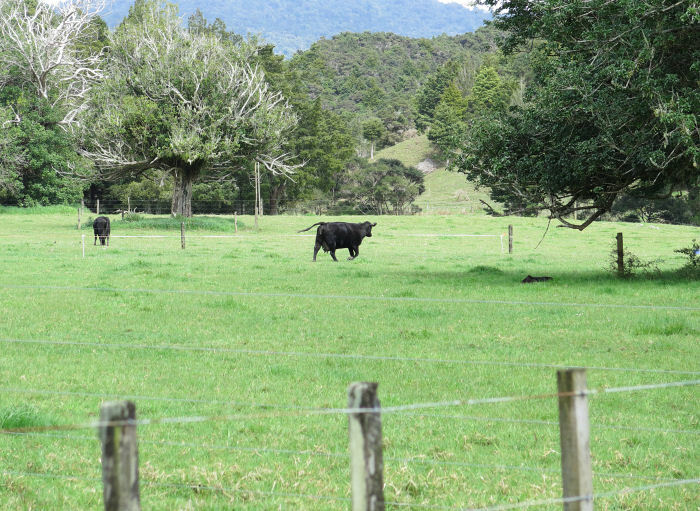 She couldn't have gone much further away from the others, our northern boundary being just up to the right of the photo and the fence against which she calved has the Swamp East on the other side. There wasn't anything I could usefully do, so I went away. 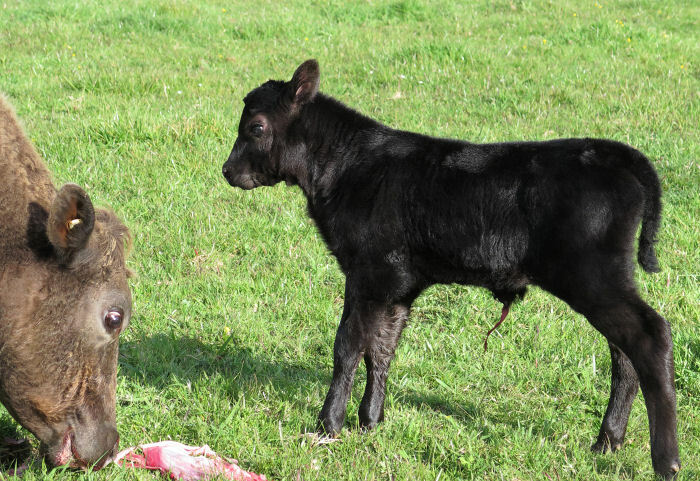 The calf is a bull. 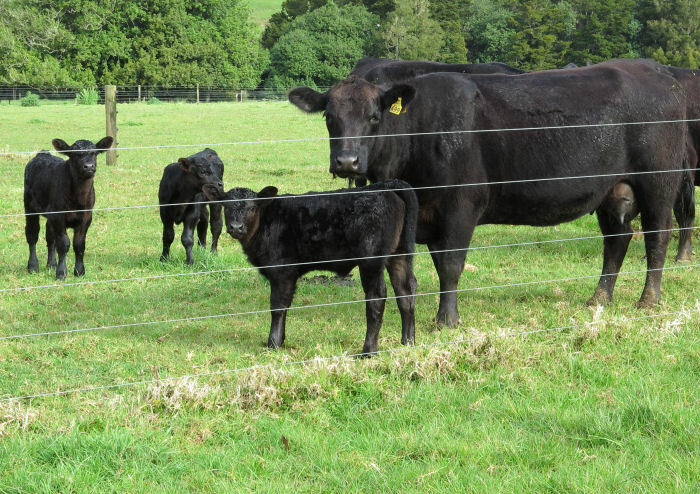 Meg with her daughter in front of her and I'm pretty sure, from the similarity in looks, Gem's calf is the furthest to the left. 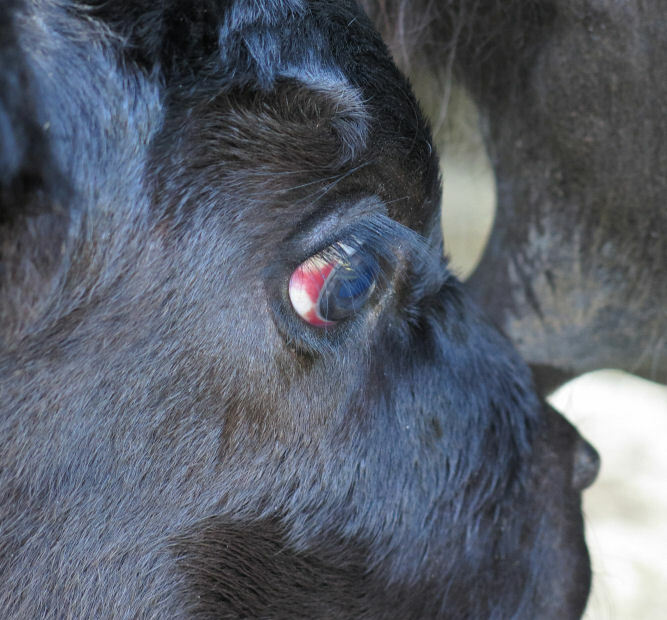 This is Imagen's son's eye, still quite bloodshot. 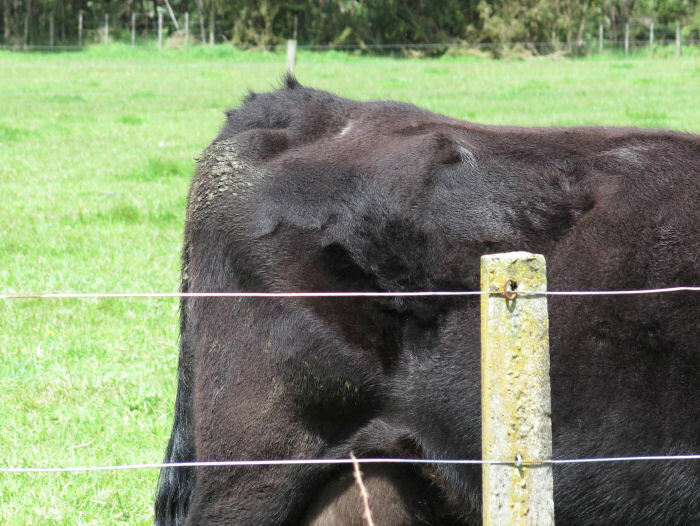 If bits of his brain are in a similar state, it's not surprising he's not a normal calf yet. 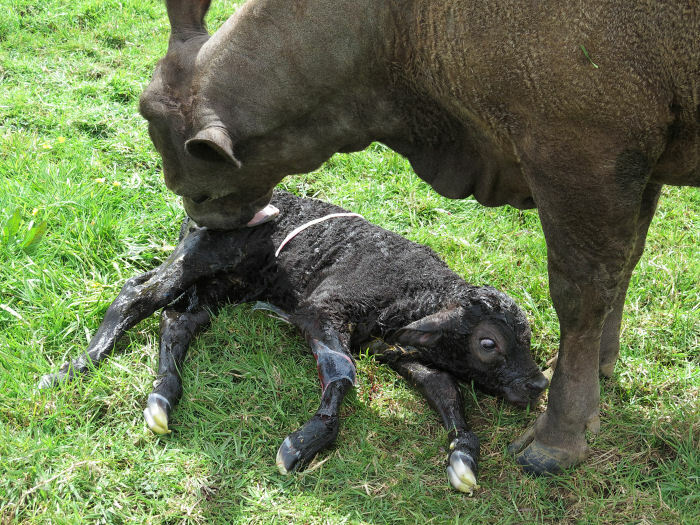 Just before 5.30, after an hour and a half's obvious labour, 703 produced a partially-wrapped calf, another bull. 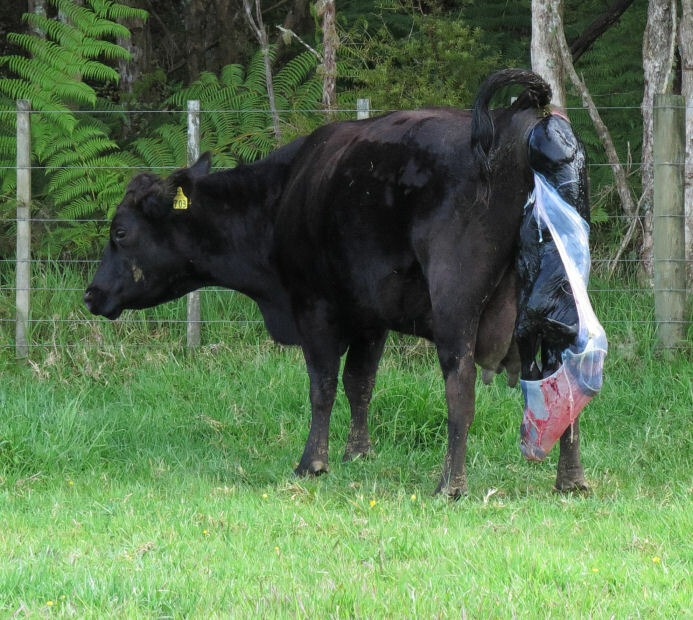 Watching a cow lick the membrane off the calf as part of the clean-up can produce some alarm, if the cow breathes at just the wrong moment and inhales a bit of it. 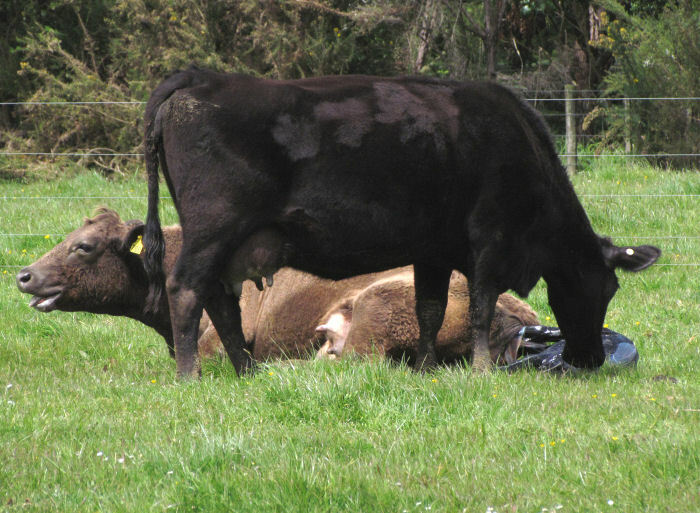 Unlike people who seem to panic when they choke, a cow breathes carefully past the obstruction so she doesn't take it further into her windpipe, so she can then cough it back out again. I have wondered if there'll ever be an occasion when I have to put my arm in the front end of a cow in such an event, to pull membrane back out when she has collapsed in suffocation? 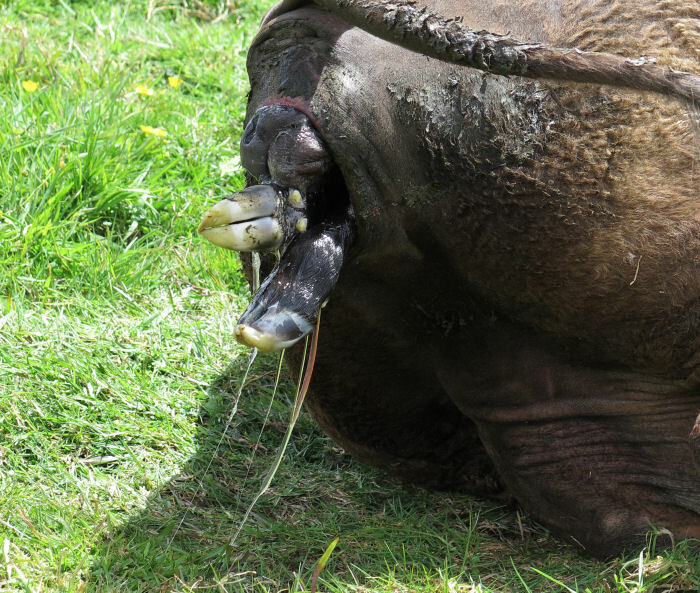 On a couple of occasions over the years I've pulled long lengths of afterbirth out of cows' mouths when they've been choking on it, for fear they'd not manage to expel it themselves. I've read of only one or two deaths from suffocation on membranes but one around here would be too many. At my last check at 9.20pm, 723 was off on her own up the top end of the Windmill paddock. She'll probably have a calf with her by the early morning. 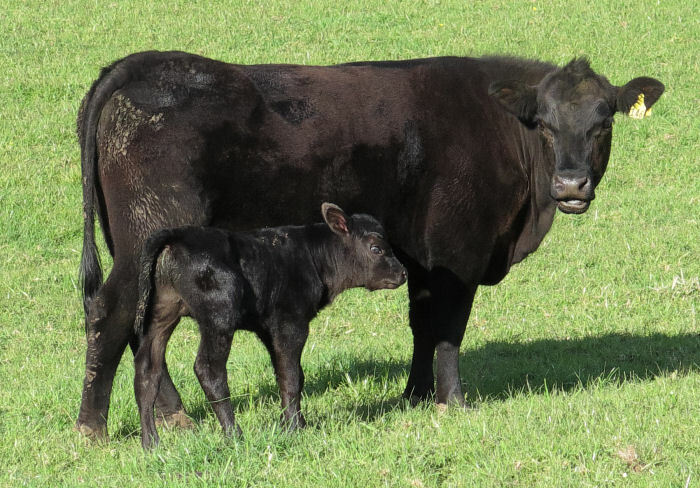 Calf tally: 14 heifers, 17 bulls (-1) = 31 of 40.